Before we delve any further. This is a public service announcement to all listeners that we want your feedback. Send us hate mail at: heatbeatmiami@gmail.com, and we'll read it on-air. All of it. 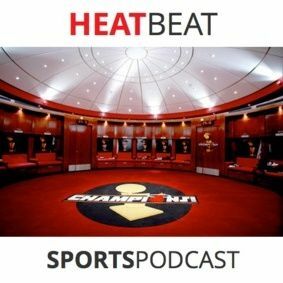 Gianni & Brian discuss Week 4 of the NBA regular season with Dwyane Wade's ongoing health issues, reminising Pat Riley's plan to make Antione Walker lose weight, and ponder, "What if the Miami Heat had Johnny "Football" Manziel." We play the game that's ... See More sweeping the nation: "Guess The Boxcore!" And Gianni continues to proclaim his mancrush on the Golden State Warriors and why a Heat vs. Warriors NBA Finals should happen.